Can you get SS Disability for High Blood Pressure? Can you get Disability for High Blood Pressure? High blood pressure is not recognized as a disability by the Social Security Administration. However, the SSA recognizes hypertension often causes damage to multiple body systems and will consider it when they assess your functional capacity. Hypertension, or high blood pressure, is a persistent, above-average level of pressure in the arteries. Temporary high blood pressure occurs frequently in healthy adults. Exercise, stress, being cold, alcohol, caffeine, and even having a full bladder all increase blood pressure significantly, often outside the normal resting range. Nearly a third of American Adults have high blood pressure and one fifth of Americans have extremely high blood pressure. Doctors blame our sedentary lifestyles, poor diets, and use of alcohol, caffeine and nicotine. 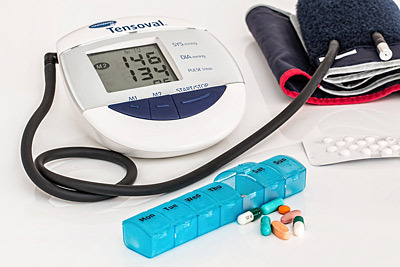 Blood pressure is measured with two numbers (110/60 mm Hg for example) with the first number representing systolic pressure and the second measuring diastolic pressure. Systolic pressure is the pressure when the heart is beating, and diastolic pressure is the pressure between beats. The unit used, mm HG, is “millimeters of mercury”, or the pressure generated by a one millimeter high column of mercury. In terms of more relatable measurements, healthy systolic blood pressure is around 2.3 pounds per square inch. A number of things can lead to increased pressure in the blood vessels. A higher level of blood volume, inflexible arteries, build-up of cholesterol, tightening of the blood vessels, or an increase in blood viscosity can all cause high blood pressure. On its own, high blood pressure can cause tears in blood vessels. However, the complications caused by high blood pressure are more serious than its primary effects. The risk of nearly every sort of circulatory disorder is increased by high blood pressure. High blood pressure forces the heart to work harder which can lead to heart attack, heart failure, heart disease, aneurysm, and aortic dissection (a rip in the aorta). Hypertension can lead to certain body parts not getting enough blood. If the brain does not get enough blood, this can cause stroke. If blood fails to flow through the kidneys, it cause kidney damage and since the kidneys help regulate blood pressure, this can cause further hypertension. Sexual dysfunction is a common symptom and often an early warning sign of high blood pressure. Additionally, hypertension can cause vision damage if blood vessels tear in the eye. High blood pressure forces the heart to work harder which can lead to heart attack, heart failure, heart disease, aneurysm, and aortic dissection (a rip in the aorta). Treatment of high blood pressure focuses primarily on lifestyle changes. Reduction of alcohol, caffeine and nicotine intake can have a significant impact on blood pressure. A low-sodium diet, aerobic exercise, and improved stress management can also help reduce blood pressure. Dietary Approaches to Stop Hypertension (DASH diet) is a treatment option that promotes a diet high in grain, vegetables and fruit and limits meat and sweets. There are many types of medication available for treating high blood pressure depending on the root cause. Beta Blockers make the heart beat slower, Vasodilators relax blood vessel walls, ACE Inhibitors prevent hormones from narrowing blood vessels, Calcium Channel blockers keep calcium from entering the blood vessels, and there are other medications which act in different ways to keep blood pressure low. Many patients take multiple types of medications to manage their symptoms. Contact the Long Term Disability lawyers at 512-454-4000 for a free consultation and see if you can get disability benefits for Hypertension. High blood pressure is not recognized as a disability in the Social Security Administration’s blue book. However, the Social Security Administration recognizes hypertension often causes damage to multiple body systems and “will consider any limitations imposed by your hypertension when we assess your residual functional capacity”. 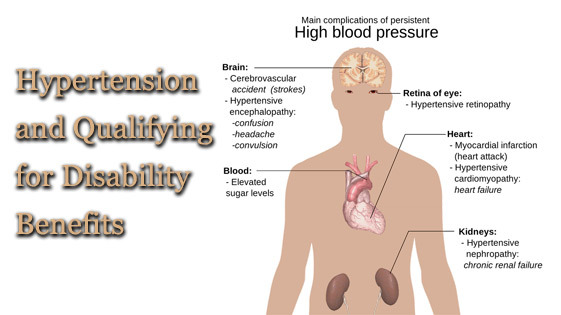 This means that hypertension on its own is not a basis for disability, but the complications it may cause may be. Also, if you unable to work due to the effects of your hypertension, you may be eligible for benefits. If you have applied for either Social Security Disability Insurance benefits, or Long Term Disability Insurance benefits and have been denied, don’t give up. Nearly two-thirds of initial claims are denied. Appealing your claim can lead to you winning benefits. However, appealing a claim can be a confusing and complicated process. Having the help of an SS disability attorney can make the difference between your claim’s success or failure. An experienced disability lawyer will be familiar with what needs to be filed and when. The attorneys at Bemis, Roach and Reed have experience filing Social Security and Long Term Disability appeals. Call them today for a free consultation. Call 512-454-4000 and get help NOW.